Flora at the Ponta de Sagres is the result of specific environmental conditions. 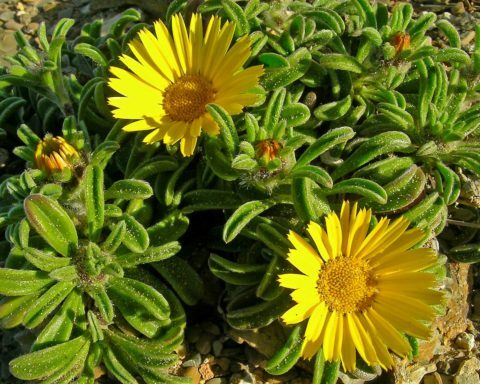 It represents a specific facet of the exceptional botanical diversity of the Vincentine Promontory, one of the most important assets of the Natural Park of the Southwest Alentejo and the Vincentine Coast (Parque Natural do Sudoeste Alentejano e Costa Vicentina). This natural heritage, with its unique characteristics, deserves the care and commitment of all of us, so that it is conserved for our interest and pleasure and for future generations. 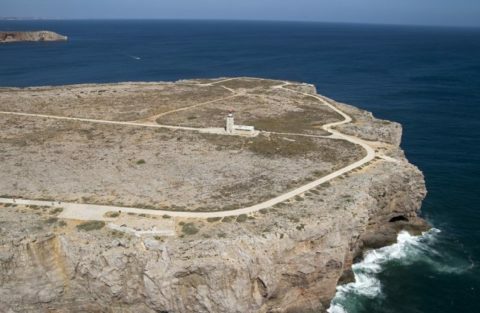 The Ponta de Sagres, where the fortress stands, consists of an imposing, compact limestone platform dating from the Jurassic period that sweeps down to the sea in vertical, rocky cliffs some 40 metres high. On the plateau, which is slightly uneven, the calcareous stone has been eroded by rainwater to create a tracery of cavities and crevices filled with red clay, the result of water gradually wearing down the rock. The soils, however, are very mixed and, sometimes, are even covered by sand from old Quaternary dunes. The climate here as on all the Vincentine headland is dry Mediterranean in type, although tempered by the surrounding Atlantic. Winters are mild, the average minimum temperature in the coldest months being 10.7°C, and summers are cool due to constant winds from the North. The average annual rainfall does not exceed 438 l/m2, with six dry months.The stiff breeze diminishes the effect of the high atmospheric humidity, accentuating the semi-arid appearance during the summer period. The soil and climate are nor the only conditioning factors as regards the local vegetation. The presence of Man down through the centuries and the almost insular isolation of the promontory, reinforced by the wall of the fortress, are determining factors in the actual vegetal landscape. This can be seen, for example, by the lack of the juniper formations (Juniperus turbinata), a characteristic of the Vincentine Coast, that were marked on an 18th century map. It seems reasonable to assume that, during the time the fortress was occupied, bushes were used as fuel and possible successive, systematic burning contributed to reducing the vegetation to the sub-shrub and herbaceous communities that exist today. Despite the fact that the fortress no longer has a military purpose, human pressure has been maintained by tourism and angling, which has resulted in considerable trampling along the edge of the cliffs. Due to this anthropogenic pressure, the influence of the wind and salt, as well as the type of soil, it is possible to define four main ecological sectors with definite floral groupings, small units where specific types of plants tend to occur together. The first sector (A), is characterised by soil altered by the depositing of rubbish and organic matter, which covers an area surrounding the constructions where Man has introduced the proliferating Hottentot fig (Carpobrotus edulis), to the detriment of the local flora. Here nitrophilous plants utilise the high degree of salt in this disturbed terrain: as is the case of the Lavatera spp. or the showy round-headed garlic (Allium ampeloprasum), and also the tree purslane (Atriplex halimus) and a wormleaf saltwort (Salsola vermiculata) that typically border the cliffs. In the second sector (B), which is made up of the cliffs, the strong wind laden with salt, and the scarcity of soil drastically condition the vegetation. The rock samphire (Crithmum maritimum) and a sea lavender (Limonium ovalifolium) spring up in the cracks in the bare rock. Lavatera mauritanica, an annual with superb purple flowers, unfortunately, now considered vulnerable also occurs at the top of the cliffs. Small grassy plots are formed in the openings in the rocks and produce plants of considerable ecological interest as they have adapted to the very high degree of salinity in the soil and to trampling, as for example the carpeted sea heath (Frankenia laevis) that has small lilac coloured flowers. On the plateau, but quite frequently stretching to the edge of the cliffs, on limestone soils with a clayey-sandy texture, the third sector (C) is the most valuable of all, when the diversity and endemic degree of this particular flora is borne in mind. The heads of the yellow sea aster (Asteriscus maritimus) dominate these cushioned sub-shrub formations. Also characteristic of this sector is the spiny tragacanth (Astragalus tragacantha ssp. vicentinus) that is endemic ro the Vincentine Promontory, but very localised and threatened with extinction. These are accompanied by a downy, greyish felty germander (Teucrium vincentinum) and, in spots more sheltered from the spray, by the thyme (Thymus camphoratus) with its reddish purple blossoms, endemic to southwestern Portugal. Also of note is a small group of bellevalsas (Bellevalia hackelli), a Portuguese endemism, the distribution area of which only very rarely extends beyond the Algarve limestone zone, as well as the autumn flowering of a beautiful wild crocus (Crocus serotinus). In the fourth sector (D), movable sand fills the crevices in the gryke, only permitting the installation of flora characteristic of coastal dunes of the southwestern Iberian Peninsula. Outstanding in this almost desert like landscape is the sea daffodil (Pancratium maritimum), a bulb which flowers in the summer, though its greyish green leaves are visible the rest of the year. The pink heads of the spiny thrift (Armeria pungens) nod in the wind, the bright yellow of the southern birdsfoot trefoil (Lotus creticus), as well as the deep blue of the shrubby pimpernel (Anagallis monelli) bring a touch of springtime cheer to this aridity. Curiously, also found here, although somewhat sparse, is the Corema album endemic to the western Iberian coast, indicating more evolved dune vegetation.